It records independent, works without PC. Saves all recording data into a SD card. 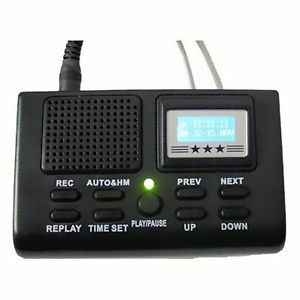 Automatically recording telephone calls, easy management, play histroy recording files anytime. This can apply to a large range of industries, company telephone calls management,small & middle scale call center, personal telephone call records etc. Play history records during a call, both sides listen the records. LCD screen. Simple user interface, simple operation. Multi storage media: SD/miniSD/TF,16G Maximum Memory. Play mp3 format recording files. High compression, 1G memory records 35 hour. Recording folder named by Date, Sequence in time, easy for search.